This dilated portion of the digestive tract temporarily holds ingested food, adding mucus, acid, and the digestive enzyme pepsin, Muscular contractions of the stomach blend these components into a viscous mixture called chyme, The chyme is then divided into parcels for further digestion and absorption by the intestines. A. General Structure: The stomach wall has the same layers as the rest of the tract. The complex mucosa contains numerous gastric glands, a 2-3-layer muscularis mucosae that helps empty the glands, and an intervening lamina propria. When the stomach is empty and contracted, the mucosa and underlying submucosa are thrown into irregular, temporary folds called rugae, that flatten when it is full. The smooth muscle of the muscularis externa is arranged in 3 layers: outer longitudinal, middle circular, and inner oblique. The stomach has 4 major regions: cardia, fundus, body, and pylorus. B. Gastric Mucosa: The stomach lining of simple columnar epithelium is perforated by numerous small holes called foveolae gastricae, The foveolae are the openings of epithelial invaginations, the gastric pits, which penetrate the lamina propria to various depths. The pits serve as ducts for the branched tubular gastric glands, Each gland has 3 regions: an isthmus at the bottom of the pit, a straight neck that penetrates deeper into the lamina propria (perpendicular to the surface), and a coiled base that penetrates deeper still and ends blindly just above the muscularis mucosae. The mucosa is characterized by the following epithelial cell types. 1. Surface mucous cells. They secrete a neutral mucus that protects the stomach's surface from the acidity of the gastric fluid. 2. Undifferentiated cells. Low columnar cells with basal ovoid nuclei are found scattered in the neck of the gastric glands. 3. Mucous neck cells occur singly or in clusters between the parietal cells in the neck of the gland. They differ from the surface mucous cells by secreting acidic mucus. 4. Parietal (oxyntic) cells secrete HCI and intrinsic factor. Parietal cell secretion is stimulated by cholinergic nerve endings. Acid production is greatly enhanced by histamine and gastrin produced by enteroendocrine cells in gastric glands (and elsewhere). 5. Chief (zymogenic) cells secrete pepsinogen and some lipase. These cells are smaller than parietal cells. They are basophilic owing to the ribosomes associated with their RER. They also contain membrane-limited pepsinogen-filled zymogen granules. Pepsinogen is an inactive proenzyme or zymogen that is converted to the active protease pepsin when exposed to the acidic environment of the stomach lumen. Gastric lipase has only weak lipolytic activity. 6. Enteroendocrine cells. In the stomach, these cells occur mainly in the base of gastric glands. They produce various endocrine and paracrine amines leg, histamine, serotonin) and peptide hormones leg, gastrin). 1. Cardia. the cardia surrounds the point of entry of the esophagus. Here, the lamina propria contains simple or branched tubular cardiac glands like those in the terminal part of the esophagus. The basal portions of these glands are often coiled, with wide lumens. 2. Fundus and body. The glands in these regions are similar in structure and function. The body is the stomach's largest region, extending from the cardia to the pylorus. The fundus is a smaller, roughly hemispheric region that extends above the cardia. Gastric glands--termed fundic glands in both regions--are characterized by shallow pits and long glands. The pits extend about a third of the distance from the mucosal surface to the base of the glands. Fundic glands contain abundant parietal and chief cells. Parietal cells are concentrated in the neck and upper part of the base, while chief cells predominate in the lower portion. Serotonin (5-hydroxytryptamine)-secreting cells are typically found at the bases of these glands. 3. Pylorus. This makes up the distal 4-5 cm of the stomach, leading to the small intestine. Pyloric glands are characterized by deep pits and short glands. Chief cells are especially scarce in this region. Gastrin-secreting cells (G cells) are typical of the bases of these glands. 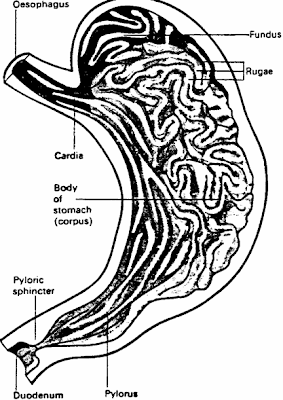 At the pylorus-small intestine junction, a thickened band of the middle circular layer of the muscularis externa, the pyloric sphincter, controls the passage of chyme. Hi Nice Blog . Whether you are human endocrine system, cramming for an exam, or just have a curiosity to find out more about what makes you tick, WinkingSkull is an amazing. Genial brief and this enter helped me alot in my college assignement. Gratefulness you seeking your information.